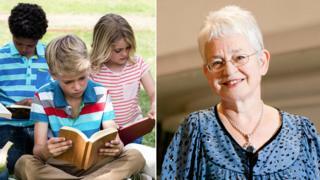 Dame Jacqueline Wilson and Chris Riddell are among 50 writers and illustrators calling for the book industry to ditch plastic. Authors4Oceans wants publishers, bookshops and readers to find eco alternatives to plastic bags, straws, bottles and single-use cutlery. Author Lauren St John came up with the idea when she bought a drink in a bookshop with a plastic straw. Other famous names involved include Sir Michael Morpurgo and Sir Quentin Blake. War Horse author Sir Michael said: "The greatest weakness we have, the greatest mistake we make is to take the world about us for granted. "We use up the earth we live in at our peril. It is a finite source and we have to remember that. Destroy it, and we destroy ourselves. It is that simple." While St John has always been passionate about conservation - she admits to being "obsessed with the demise of the tuna - I want people to stop eating tuna" - she credits David Attenborough's Blue Planet II with putting a spotlight on the plastics problem. Image caption David Attenborough - "a miracle of a person"
"Blue Planet lit a bonfire under us collectively - when I had the straw epiphany, it was just before that," she told BBC News. "Thank god for David Attenborough, a miracle of a person. He has single-handedly done so much to raise awareness." The author, who has previously been on a dolphin rescue mission in Turkey with Born Free, adds: "This is a problem that has reached critical mass. It's an emergency. We need to do something now." The campaign will feature beach cleans and festival events - including at Hay next month - to raise awareness of plastic pollution. St John, who is an ambassador for the Born Free Foundation and whose books include The White Giraffe and Dolphin Song, says: "I feel a huge responsibility to leave the planet a better place for our younger readers. "I grew up on a farming game reserve in Zimbabwe and I had a pet giraffe! We had a massive menagerie, so I grew up saving animals." When she bought her drink in a bookshop and was handed a plastic straw, St John says: "It made me think of all the bookshops across the UK - there are 300 branches of Waterstones alone - and about how many of them dish out plastic straws and bags every day. "Maybe if I start something with my author friends, we can start an alliance." St John is also running a competition, working in partnership with the Marine Conservation Society, Action for Conservation, the Born Free Foundation and The Week Junior, asking school pupils to make models of endangered sea creatures out of plastic rubbish. She has also created the Authors4Oceans website, which has teacher resources and tips on how to reduce plastic waste.